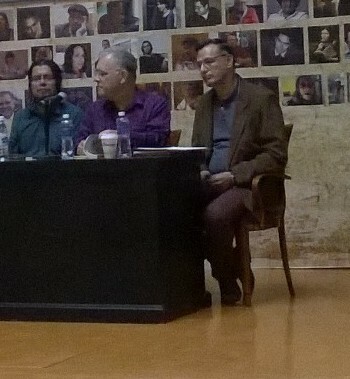 From left to right: Juan Jose Radinas, Bill Mohr, Antonio Malpica. Photograph by Rocio Arellano. (c) 2015. All rights reserved. Used by permission. I’ve been back from Mexico almost as long as I was there, and have been slow to get back to blogging. In part, it’s due to the start of school. I got through customs at LAX at 10:00 p.m. on Sunday, August 23. I met my first class at CSULB at 11:00 a.m. the next morning. All is going well at school so far; and the anthology I’m co-editing with Neeli Cherkovski is coming down the home stretch. As has been the case with the entire project, I’m in the driver’s seat, but Rebecca Chamlee (the book’s designer) is doing an excellent job at helping me negotiate the final stages of production. The poetry tour of Mexico was a wonderful morale-booster. I read my poetry at venues in Mexico City, Cuernavaca, and San Luis Potosi, and had a chance to talk with poets from Spain, Ecuador, Israel and Brazil. I also had dinner with my translators, Jose Rico and Robin Myers. Jose was extraordinarily generous with his time: he met me at the airport when I arrived and accompanied me to catch my return flight, too. Our bus ride to Cuernavaca included a session of swapping jokes that left both of us struggling to muffle our laughter so as not to disturb the other passengers. We were sitting at the very rear of the bus, but I am fairly certain that the driver must at times have wondered about what was happening at the other end. One of the best parts of the trip was the final evening of the festival at San Luis Potosi. Three beloved actors read short selections of our poetry or fiction to a standing-room only audience, which applauded each of us generously. I felt very fortunate to have my work read in an instant anthology alongside the work of Gloria Gervitz, Juan Jose Radinas, Antonio Malpica, Denise Desaultes, Luis Alberto Arellano, Rocio Arellano, Paulo Ferraz, Anat Zacharia, Jose Rico, and Maria Angeles Perez Lopez. This coming Saturday, April 5th, Los Angeles will have a chance to hear the poetry of the main organizer of festival at San Luis Potosi, Jorge Humberto Chavez, at Avenue 50 Gallery. I will be reading briefly at his reading along with David Shook and Anthony Seidman. In addition, Carol Colin will still have her paintings up. In recent weeks, Los Angeles has lost two important and inspiring artists. Lynn Manning, a vigorous poet and indefatigable cultural worker, died around the time that I left for Mexico, and Noah Davis, a marvelous painter and visual arts activist, died just a few days ago. I met Lynn only a few times over the years, and was always impressed with his poetic commitment; I devoutly hope that he is included in the anthology that Luis J. Rodriguez is putting together. I never met Mr. Davis, though, and feel a pang at his passing. There are people who would seem to be cut off early on and have left much undone, but about whom that is mere illusion. In point of fact, they did exactly what they were meant to accomplish. Noah Davis lifted off from this planet, though, with his vision still unfolding, and he deserves to have the implications of his projects kept in mind by his peers for the next several decades. Posted on September 1, 2015 by billmohr. This entry was posted in Painting and Sculpture, Poetry. Bookmark the permalink.